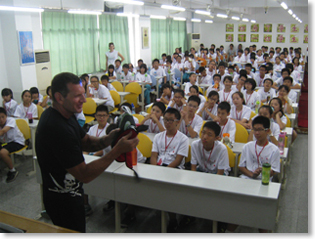 On July 24, 2015, the Hong Kong Academy of Ice Hockey was invited to Guangzhou by the Canada-China Culture and Education Association to do a demo with around 50 students. 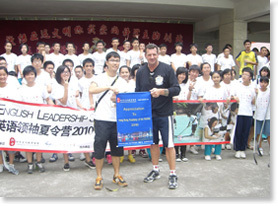 Coaches Robert and Jeremy attended the event. 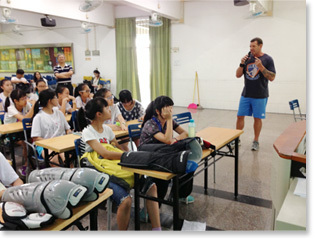 The students first watched a short video about ice hockey in Hong Kong and tried on the hockey equipment. They then learnt to play floor hockey at the nearby basketball courts. 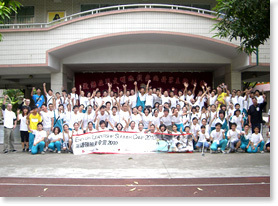 The teachers also joined the game to play against the students at the end. Overall the event was a success and we want to thank the CCCEA for organizing the event with the school and also all the students and teachers that helped with the organization of the demo. 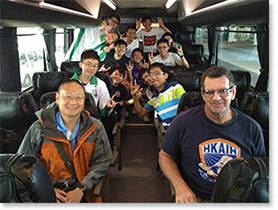 This is the third time the HKAIH has brought teams to participate in this annual tournament. 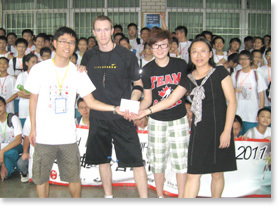 However this is the first time the HKAIH brought along a school team to the event. The team definitely gained unforgettable experiences by joining such a competative tournament. In the year to come, we hope to continue our support to the tournament and bring our students over to play at this fun and exciting competition. 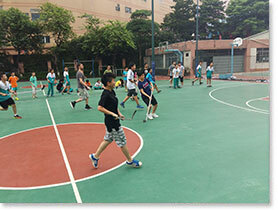 The students were able to try the equipment, view a short video of the current event of ice hockey in Hong Kong and then were also treated to playing ball hockey at the nearby basketball courts. Overall the event was a success and we want to thank the CCCEA for organizing the event with the school and also all the students and teachers that helped with the organization of the demo. 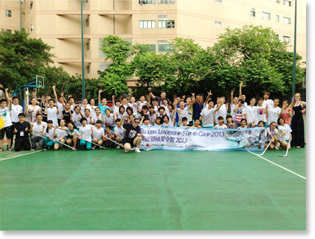 On the 19th of July 2012, the Hong Kong Academy of Ice Hockey was invited by the Canada-China and Education Association, to do an ice hockey demonstration for middle school students from the Guangzhou area. It is the third year of HKAIH being invited to arrange demonstration for their English camp which focused on Canadian culture. 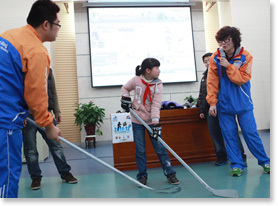 The demonstration began with an explanation of ice hockey and where it originated along with how a hockey puck is made. A more detailed description of the equipment was presented by Coach Barry Beck. 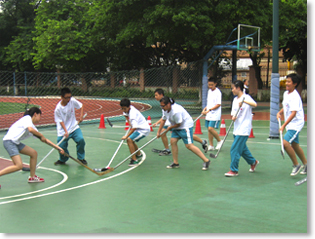 Afterwards the students all had the chance to play ball hockey and experience the game along with fellow classmates. 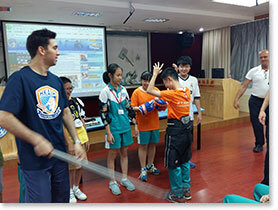 Thank you to the Canada-China Education Association for inviting HKAIH again to participate their English camp and make this demonstration possible. 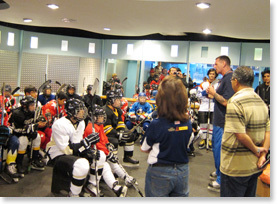 HKAIH general manager /coach Mr. Barry Beck was invited by the Malaysia Ice Hockey Federation (MIHF) to visit Malaysia and provide a coaching clinic for Ice Hockey players in Malaysian capital of Kuala Lumpur. 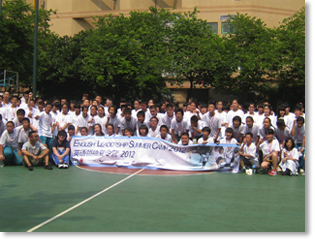 A total of 41 players participated in the clinic. 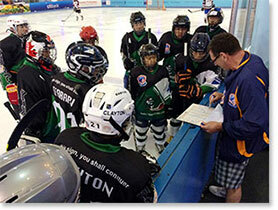 The clinic which ran between June 8 and 10, 2012 enhances players’ ice hockey skills. 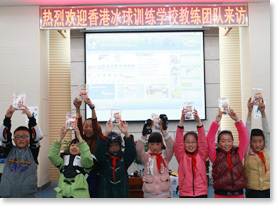 The clinic was designated for two different age groups which were youths and adults. The first day was an on ice training class. 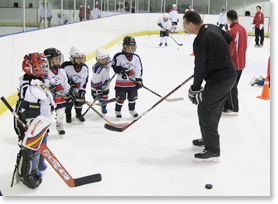 For the youth’s session, it concentrated on the technical aspects of fundamentals such as skating exercises, puck handling, passing and shooting. For the adult’s session, it focused on high tempo drills and shot blocking. The second day was a dryland training class. Players worked on foot work and pylometric exercises. All these exercises can be beneficial for on ice pivoting and quick feet acceleration. 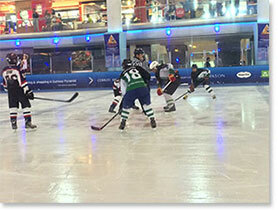 The third day was the last on ice training class which was mainly focused on attacking and defending tactics. The clinic was a huge success! We would like to thank the MIHF, all the players in Malaysia that attended and other volunteers for supporting the clinic. 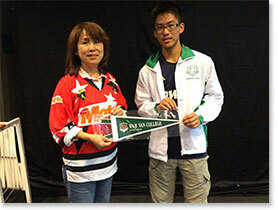 We would also like to thank MIHF general secretary, Ms. Susan Loh for her support and professional arrangement. The cooperation between the HKAIH and MIHF could not have happened without all the support from all parties and we hope that we can continue this collaboration in future events. 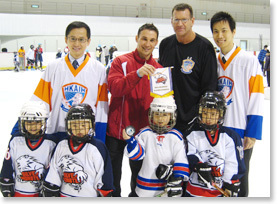 This year, the 2011/12 Youth Hockey League’s (Asia Region) final stop took place in Nanjing and was a great opportunity for promoting ice hockey to southern China. 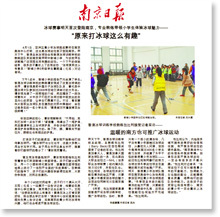 During the intensive schedule of 2 days of competitions, HKAIH visited one of the local primary schools – the Nanjing Xin Cheng Xiao Xue to do an ice hockey demonstration. 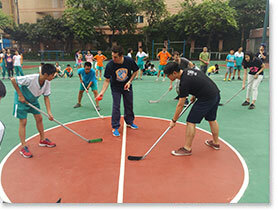 We hope this demonstration could become a model for the Nanjing ice hockey organizations to continue to run similar activities to other local schools, for promoting and developing the sport of ice hockey locally. 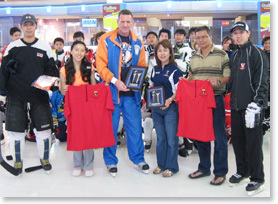 Presented by HKAIH General Manager (Coach) Barry Beck and assistant coach Tan Anqi, the sport of ice hockey was introduced and detailed description of the equipment was provided. 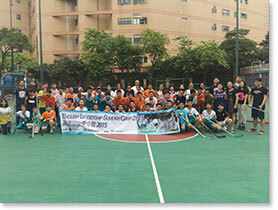 Afterwards the students had a chance to play ball hockey and experience the game along with fellow classmates. The kids were excited to have had the chance to play this new sport and they are willing to continue to learn more about ice hockey on real ice in the future! 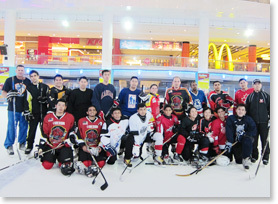 On the 15th of July 2011, the Hong Kong Academy of Ice Hockey was invited by the Canada-China and Education Association, to do an ice hockey demonstration for middle school students from the GuangZhou area. It is the second year of HKAIH being invited to arrange demonstration for their English camp which focused on Canadian culture. 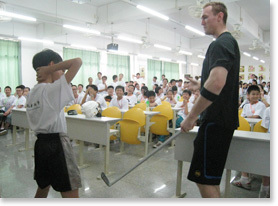 The demonstration began with an explanation of ice hockey and where it originated along with how a hockey puck is made. A more detailed description of the equipment was presented by Coach Kyle Simms. 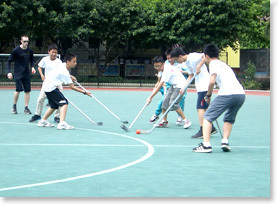 Afterwards the students all had the chance to play ball hockey and experience the game along with fellow classmates. 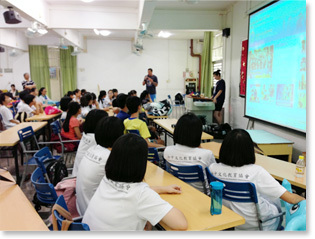 Thank you to the Canada-China Education Association for inviting HKAIH again to participate their English camp and make this demonstration possible. 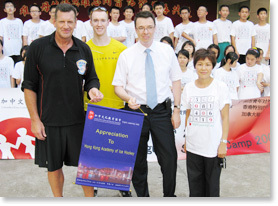 On the 16th of July 2010, the Hong Kong Academy of Ice Hockey was invited to Guangzhou City to do an ice hockey demonstration for secondary students from the GuangZhou area that were participating in an English camp which focused on Canadian culture. 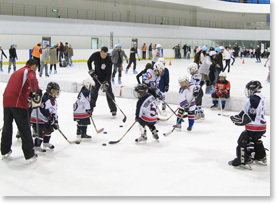 The demonstration began with an explanation of ice hockey and where it originated along with how a hockey puck is made. A more detailed description of the equipment was presented by Coach Kyle Simms. 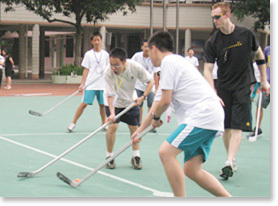 Afterwards the students all had the chance to play ball hockey and experience the game along with fellow classmates. 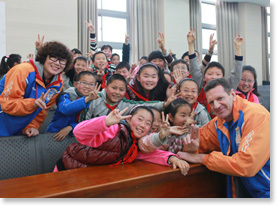 Thank you to the Canada-China Education Association for making this demonstration possible. 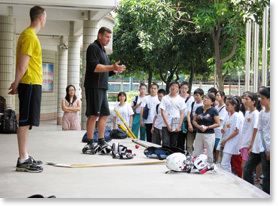 On the 17th of July 2009, the Hong Kong Academy of Ice Hockey was invited to Guangzhou City to do an in hockey demonstration to secondary students from the GuangZhou area that were participating in an English camp which focused on Canadian culture. The demonstration started with a detailed description of ice hockey equipment with Assistant Coach Kyle Simms explaining how the equipment protects people while playing ice hockey. Afterwards the students were given a chance to play some ball hockey outside. Although the trip the academy made was solely to promote the sport, the students learned about the sport and were able to get a basic idea of how ice hockey is played. 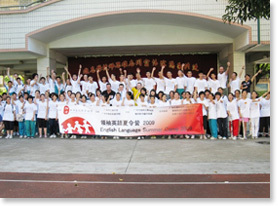 Thank you to all the staff of the camp in GuangZhou for making this whole event a happy and successful one.